Notre Dame was awarded a number one seed in the NCAA tournament with the ACC Championship victory over Louisville securing a spot in the Chicago regional. Stanford, Iowa State, and Texas A&M are the two through four seeds in ND’s region. The Irish will open NCAA play this Saturday morning at 11 am eastern on ESPN2 against 16 seed Bethune-Cookman followed by the winner of the 8 - 9 matchup between Central Michigan and Michigan State. The second round game will be played Monday. ESPNU jumped the gun and released the brackets mid-afternoon Monday. As a result, the selection show on ESPN2 was moved up to 5 pm eastern from the scheduled 7 pm show. The biggest surprise of the selection unveiling was UConn as a two seed with Louisville taking the top seed in the East Regional. The Huskies will still play close to home in Albany, NY after they dispatch two lower seeds at home this weekend. UConn had long been considered a lock for Albany — but as a one seed with Louisville the two. Both the RPI and Power ratings released after the end of conference tournaments had Notre Dame and Louisville both ranked above UConn. The other number one seeds are Mississippi State in the West with the regionals to be played in Portland, where Oregon sits as a two seed. Baylor will go to the South Region in Greensboro with Iowa the two seed. The ACC ended with five teams among the top 16 — NC State, Miami and Syracuse are the other three. Florida State, North Carolina and Clemson were also named to the 64 team field making a total of eight ACC teams in the tournament. Notre Dame will open tournament play on a roll averaging 96.0 points per game with a 28.7 victory margin in the 9 games since losing at Miami. The run includes five games against ranked teams — including current top ten squads Louisville and NC State. The Irish have scored 90 points or better in 8 of the 9 games and they hit 89 in the one that they failed to reach 90. Over that span, the five starters have made 55.1% of their shots from the field and 79.5% from the line. Jackie Young, Jess Shepard and Brianna Turner have made 200 of 312 shots combined — 64.1%. Notre Dame is one of just two teams in the top 16 seeds with all five starters averaging in double figures for the season — UConn is the other. And, no team has two 2,000 point career scorers and three others with over 1,000 points. All five are putting together career years. Arike Ogunbowale passed Skylar Diggins-Smith with a 25-point effort against Duke last month to become Notre Dame’s all-career scoring leader. Heading into this weekend’s play, her career total now stands at 2,471 points. She averaged 20.8 points per game her junior season — just the third Notre Dame player to post a season average of 20 points or more. It was a feat that hadn’t been accomplished in over twenty years since Katryna Gaither averaged 20.4 in ’96-97, one year after Beth Morgan posted an average of 20.2. 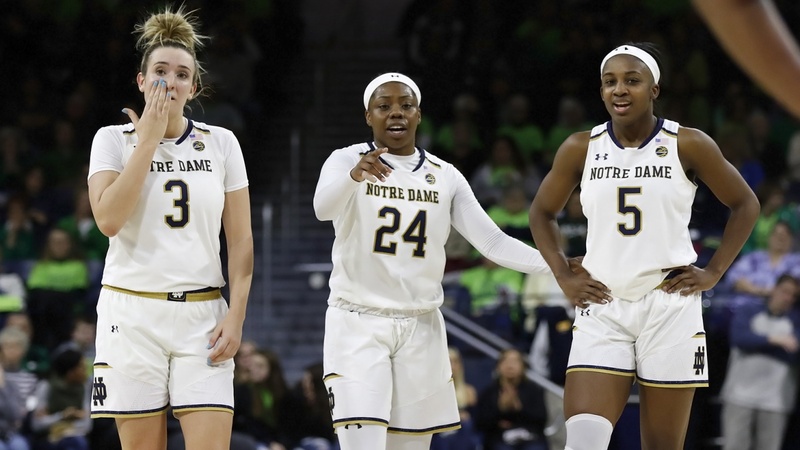 If Ogunbowale can hold her scoring average at 20 points per game through NCAA play, she will be the first Irish player to record back-to-back seasons with an average of 20 or more. Her current season scoring average is a career-best 21.0 points per game. Over the first seven games of Notre Dame’s season-closing hot streak, Ogunbowale led the team in scoring each game and averaged 24.7. She slumped a bit in the final two ACC Tournament games with just 12 points in each — but her average over the last 9 is still 21.9. Ogunbowale led the Irish in scoring in 19 games and scored the second most in seven more. She scored at least 20 points 21 times — she went for 30 or more in five of those games. Her 138 made free throws are most on the team and she’s connected on 87.1% of her free throw attempts over the last nine games. Ogunbowale has 130 assists for far this season for a career-high average of 3.9 per game. She’s already snagged a career-high 62 steals in her senior season. Marina Mabrey broke Alicia Ratay’s career mark for most three-point baskets at ND during the ACC Tournament. Her record is now 265 and counting. She’s shooting 49.8% from the field for the season — 57.9% from two and 43.6% behind the arc. She leads the ACC in 3 point percentage both for the full season and in the conference. Her 2.9 made threes per game against ACC opponents also leads the conference. Mabrey has scored 1,851 career points — had she not missed five games at the start of this season, she would be within striking distance of 2,000. Mabrey’s recorded 133 assists for the season for an average of 4.8 per game with an assist to turnover ratio of 2.2. Both are career bests. Her career assist total is now 462. Over the last nine games, her assist to turnover ratio is a sparkling 4.1. She scored 20 or more points in seven of 28 games. She’s been the team’s top scorer in 6 games and second best in five others. After sitting out last season to recover from an ACL injury, Brianna Turner now appears to be fully recovered. Her stellar play over the past nine games is a key reason why the Irish are peaking. She’s made 68 of 89 field goal attempts (76.4%) over the last nine games increasing her ACC-leading field goal percentage to 67.4%. She’s made 75% of her free throw attempts over the past nine games — upping her season average to 67.4%, a career high. She’s averaged 18.4 points per game over the nine-game hot streak. Turner has seven double-doubles and finished as the team’s second high scorer in six games. Turner is the ACC’s block leader averaging 2.6 blocks per game over the full season — and 3.1 blocks per ACC game. Her 87 blocks this season is just two behind her previous season high, a mark she seems certain to shatter. Turner needs just 69 points to reach 2,000 and ten more rebounds to snare 1,000 for her career. She has an excellent chance of reaching both marks in the post-season. She also has a chance of matching Ruth Riley’s Irish record of 370 career blocks. She currently has 350. Jess Shepard is already a member of the exclusive 2,000 point/1,000 rebound club. Her two years at ND following two at Nebraska has produced 2,233 points and 1,175 rebounds. She’s second in the ACC behind Turner in field goal percentage, and her 60.8% season mark is the best of her career. She’s also hitting a career-best 70.7% from the line — a mark enhanced by making 80.5% from the line in ACC play. She’s averaging 17.1 points and 10.1 rebounds per game in the ACC, and she’s already recorded more rebounds this season than in any of her first three seasons. She turns her defensive rebounds into break-out scoring opportunities for the Irish with outlet passes many analysts consider the best in the nation. Shepard is averaging a career-best 3.2 assists per game. Shepard is a true road warrior — shooting, scoring and rebounding better on the road than at home. She averaged 18.4 points and 10.7 rebounds on the road in the ACC while making 65.9% of her field goal attempts. Her averages at home against conference opponents were 15.3 points, 9.1 rebounds and 53.9% from the field. She scored a season-high 30 points in the ACC championship game against Louisville. She averaged 20 points per game and 10.3 rebounds in the tournament. She made 66.7% of her field goals. Shepard had double-doubles in fourteen games, led the team in scoring four times and was second in scoring in eight games. The lone junior on the starting five, Jackie Young scored her 1,000th point at Notre Dame during the ACC-season opener against Pittsburgh. She’s since added another 265 points to stand at 1,265 heading in the NCAA tournament. She is currently averaging 14.8 points, 7.3 rebounds, 5.3 assists this season — all career highs, as is her 55.4% shooting percentage for the season. Her assist to turnover ratio is 2.6 — the best of her career. She’s also recorded two triple-doubles this season — the first Irish player to record more than one in a season. She’s also registered seven double-doubles. A reluctant three-point shooter for most of the season — she only attempted 18 threes over the first 28 games of the season — she’s hit 5 of 9 over the past four games. Young is starting to become more aggressive on the offensive end. After averaging 10.2 shots per game for the season, she took an average of 14.3 per game in the ACC Tournament. The 18 shots she took against Louisville in the championship game was the most in any game this season. Young was named the most valuable player in the ACC Tournament after averaging 19.3 points, 10.0 rebounds and 6.0 assists. She led the Irish in scoring in five games and scored the second most in another seven. With ready and able offense at each position, this year’s starting five presents opponents a greater challenge than last season’s national championship squad. If the Irish can sustain their recent level of play, ND will be a very tough out.